Soulcalibur VI has not one but two story modes, and today Bandai Namco has spilled the beans on what to expect from Libra of Soul. We saw some of it in a trailer that premiered yesterday, but now we have much more detail on how it works – and yes, Geralt is indeed a fully integrated part of the storyline proceedings. Libra of Soul is essentially an RPG-style take on the Soulcalibur formula, where you create your own character – similar to some of the previous games – and take them on a grand ol’ quest. You’ll be able to play as one of 16 races, most of which offer gender choices, and get into an expanded character creator that offers sliders for some nitty-gritty fine-tuning. In addition to visual customization, you’ll be able to choose your playstyle. That, of course, builds off the broad details of the game’s existing characters, but you’ll have the chance to choose individual weapons and equipment, customizing the look of your gear. Zasalamel guides you throughout the story, and you’ll have your own choices in how things play out thanks to dialogue options. There’ll be some bits that just give extra pieces of story and lore, but also grander choices in how the story will eventually go. Your custom character can trend toward good or evil along the way. The flow of the mode has you exploring a world map, spending resources on travel to move from point to point. This being a fighting game, you’ll meet opposing fighters, and each match will have its own specific conditions and objectives – whether that means starting with a depleted health bar, losing access to certain moves, or needing to make use of a certain weapon. Some enemies might be too tough for your character, so you can hire mercenaries to even things out. Those can include community-created characters, as the game will pull from an online list of custom-built fighters to fill out the mercenary ranks. 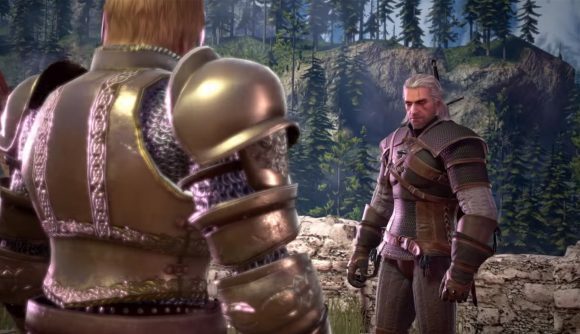 You can see a bit of Geralt in the trailer above, and during the presentation we saw today Bandai Namco confirmed that he will be a fully voiced part of the story with his own role to play. We didn’t hear much about the more traditional Soul Chronicle story mode today, but Bandai Namco did say we’ll play as “each and every character” in the game through the events of Soulcalibur 1 and 2, and that might just mean a proper Geralt-focused path. That portion of the timeline would, in theory, include the likes of Link, Heihachi, and Spawn, so he’s certainly not the most incongruous addition to the world.